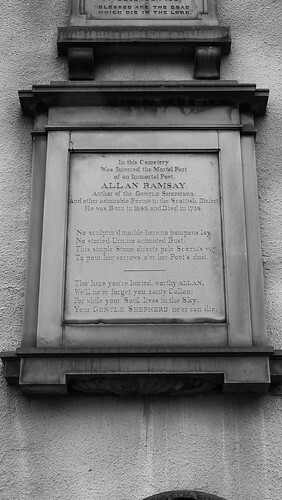 A memorial on the side wall of old Greyfriars Kirk, to the early Enlightenment period poet, librarian and publisher Allan Ramsay (1686 to 1758). Ramsay is held to be an important figure linking the earlier period of great Scottish makars (a makar is a Scots term for a very gifted poet, a maker of words, we still use the term today with the post of National Makar) from previous centuries and later Robert Fergusson and Robert Burns. He is one of the poets whose sculpture adorns the huge Scott Monument soaring up into Edinburgh's skyline, and has a full statue in Princes Street Gardens in the city.